Make Our Home Town Your Port of Call! Your family will want to visit our many fine restaurants, exceptional shops, museums, enjoy the beautiful parks, take a boat ride on the river, play and swim at the beach, or go fishing. 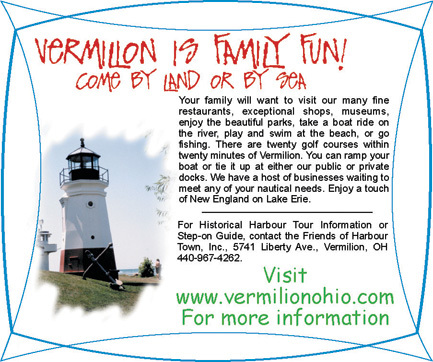 There are twenty golf courses within twenty minutes of Vermilion. You can ramp your boat or tie it up at either our public or private docks. We have a hostof businesses waiting to meet any of your nautical needs. Enjoy a touch of New England here on Lake Erie.